Preheat the oven to 200°C, gas mark 6. Place the flour and butter in a bowl. Using your fingertips, rub in the butter until it resembles fine breadcrumbs. Add the egg, orange zest and juice and, using a fork, combine until the mixture forms a ball. Alternatively, use a food processor to make the pastry. Wrap in clingfilm and chill in the fridge for at least 30 minutes. Roll the pastry out on a lightly floured surface to 3mm thick. Cut 12 rounds using a 6cm pastry cutter and line a 12-hole bun tin. Fill the cases with the mincemeat. Re-roll the remaining pastry and cut out 12 stars using a star-shaped cutter. Place on top of the mincemeat. Brush each pie with a little of the egg glaze and bake for 10-12 minutes or until golden brown. Leave to cool for 4-5 minutes, then transfer onto a wire rack. 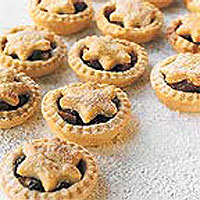 You could make 24 mini mince pies: simply use a 5cm cutter and use 2 x 12-hole mini bun tins. To freeze, make up but don't bake the pies, then freeze in the tin. Once frozen, store in bags. To use, pop back in the tin, glaze and bake for 12-15 minutes from frozen.